Deliberately devoid of representational elements, the new federal Chancellery by Stieldorf Architects was supposed to project an air of restraint. Understatement characterized all public buildings in Bonn, but sober architecture was not without its critics. For architecture critic Heinrich Klotz, the fixation on pragmatic rationalism in public buildings resulted in “an architecture of the General Accounting Office” [Rechnungshofarchitektur]. Sheathed in dark bronze-colored aluminum panels, the Chancellery was at best indistinguishable from any corporate headquarters of the time. In Klotz’s more critical estimation, it was reminiscent of a catafalque. The photograph below shows the Chancellery, completed in 1976, with the sculpture Large Two Forms, by British artist Henry Moore. 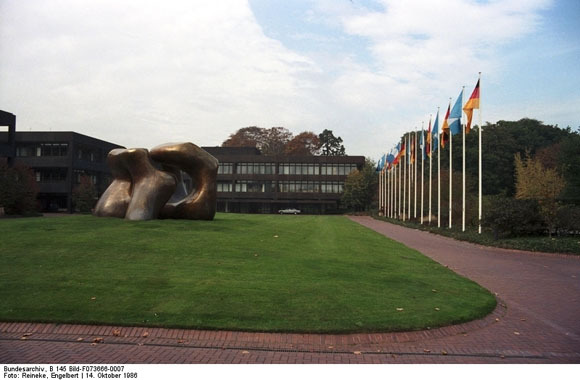 The sculpture, which was installed in the Chancellery’s forecourt in 1979, was chosen after Willy Brandt had vetoed plans for a globe-like structure. Brandt feared that such a sculpture might be misinterpreted as a sign of Germany’s renewed aspirations in the international arena. [See Michael Z. Wise, Capital Dilemma: Germany’s Search for a New Architecture of Democracy. Princeton, 1998, pp. 31-32 and plates.] Photograph by Reinck.